At the time, I couldn't quite formulate the answer this question deserved, because it's a long answer. But now, here it is. I suppose you could say it’s a valid point. My hype levels surpassed Myoky’s for Metal Gear Solid V, a game series with so much history for him. Meanwhile, I beat Xenoblade Chronicles the day before X was released. It does need to be mentioned that I am horrible about my backlog, but once I started playing Chronicles I was compelled. I have to credit the nice folks that followed my blind Let’s Play of the game. It became more than a game through them, it evolved into a experience. Peering into my YouTube alerts was downright enjoyable throughout- discussing story, strategy, hearing stories of how others experienced the game. Not only was the game itself a rewarding experience, I also remembered the reason I love Let’s Play. It’s not about the gimmicks, or pushing yourself before a great game to market and propel yourself via the medium. I do want to cover how people disrespect source material in numerous modern Let’s Plays, that is best saved for another time. It is about the games, the love and passion for them. Let’s Play reminds me of when I would play new RPGs with my childhood best friend. RPGs were usually out of my reach when I was younger- at least the SNES ones. We’d rent games like Final Fantasy, Secret of Mana, and Lufia II. I was also fortunate enough to own and share Earthbound, Harvest Moon, and Super Mario RPG. Each day after school, we’d delve into various RPGs and games. Co-op was usually not an option- so just taking turns and being able to share the story and experience was the norm. While some games like Tales of Destiny allowed co-op during Battles, it was a rarity. Eventually, things happened and my friend had to move. He ended up moving across town, and it was difficult to go see him not having a car and all. I guess being thirteen didn't help either, but I digress. During the winter of the first year of this move, my friend introduced me to a GameCube game called Phantasy Star Online Episode I & II. A co-op sci-fi action RPG remake from the Dreamcast era, Phantasy Star Online was like no game I had ever seen before. I think I was sucked in at the point of character creation, though who wouldn’t be with that jamming theme? After creating your character, you delve into the world of PSO. You learn of the plight of the people on the Pioneer 2, forced to settle on a foreign planet by the name of Ragol. After this, narrative takes a back seat to gameplay unless you actually care to find it. Even more striking, you can miss a very important plot hook if you don’t talk to Principal Tyrell’s assistant in the Pioneer 2- you won’t know that his daughter, Red Ring Rico, has already traveled to Ragol and hasn’t been heard from since. This is important, because Rico is the vehicle by which you are delivered a majority of PSO’s plot. Her recordings are present all over Ragol. She even communicates how to proceed through Ragol, how to eventually arrive and come face to face with Dark Falz. The narrative is captivating, if you put the time in to experience it. Of course, co-op is another great feature of the game. I played with my friend, us sharing loot and taking down new bosses. Ah yes, loot. The gear you found on Ragol was a compelling point of gameplay. Just seeing that red rare drop box was inebriating and addicting. Sure, it was probably just another one of Flowen’s Swords(where did that guy get so many?! ), but that next box could be the one! Eventually, we stopped playing PSO. It happens. Flash forward to 2005- PSO Blue Burst was released on PC. I never experienced the online aspect of the game on my GameCube. We didn’t have an adapter for it, and monthly fees for a game had been a foreign concept to me. Thus, Blue Burst was my first experience with the online aspect of the game. I joined my first dedicated MMOG and now-defunct online forum community. It was the weird, eclectic, and not-often-talked-about younger sibling of PSO World. It was there I met people to play Blue Burst with. I joined a guild, I hunted to help it. Phantasy Star Online opened up an experience I had missed on the Gamecube, and that was well… the online portion! I hadn’t really played the game until this point, no, not without the online aspect. Most people will cite their first online RPG experience as Ultima, Everquest, perhaps World of Warcraft in these times… but mine was Phantasy Star Online. The game became a part of me, and my Whitill ID name I had used since the Gamecube version, Fayorei, became my online handle. While Blue Burst was a great time, Phantasy Star Online just did not have much time left. Phantasy Star Universe was on the horizon with a 2006 release date. It promised so much alongside the gorgeous graphical updates. The tagline of “A new phantasy for the new millennium” appears in its E3 2004 trailer. Fully ride-able vehicles, no mention of Ethan Waber, though he appears in the trailer and looks like just another HUmar. Previews cemented these promises, but the game was widely considered a disappointment compared to Phantasy Star Online- even though it developed a small, yet dedicated fanbase. I think in short, the adventure felt down-scaled and game mechanics such as leveling techs became frustratingly tedious. How annoying, you might ask? There were dedicated game rooms to chain-cast support techs to level them up! The addition of single player didn’t help the game in any fashion- it wasn’t a groundbreaking story by any means. While I have my particular fondness for Ethan Waber and Karen Erra, I even knew as I was playing the game the story was mediocre accompanied by at best, average gameplay. This was in 2006. This was when Phantasy Star Universe was released. Subsequently- even though Phantasy Star Online 2 was announced, released in Japan, and remains in an indefinite Schrodinger’s release for the US, it wasn’t what I wanted. It’s a good game, truly- but the accessibility of it is limited without that localization. The story really isn’t that great either. Nothing compared to the narrative left by Red Ring Rico in Phantasy Star Online. That was 2012. Flash forward to 2013, where Nintendo debuted X for the Wii U during their January Nintendo Direct. This trailer still is available on Nintendo channel, simply called the “Monolith Soft Trailer”. I was blown away- this looks like Phantasy Star Online! Is that a HUmar?! This music- it sounds like something straight from PSO! The trailer closes with a giant X appearing in the center of the screen. THIS is what I wanted Phantasy Star Universe to be, THIS is what I had been waiting for those past 9 years. I was curious about the X- was this a sequel to Xenoblade Chronicles? I had just purchased it in April of 2012 since the Wii’s library of RPGs was very limited, and I had heard great things. 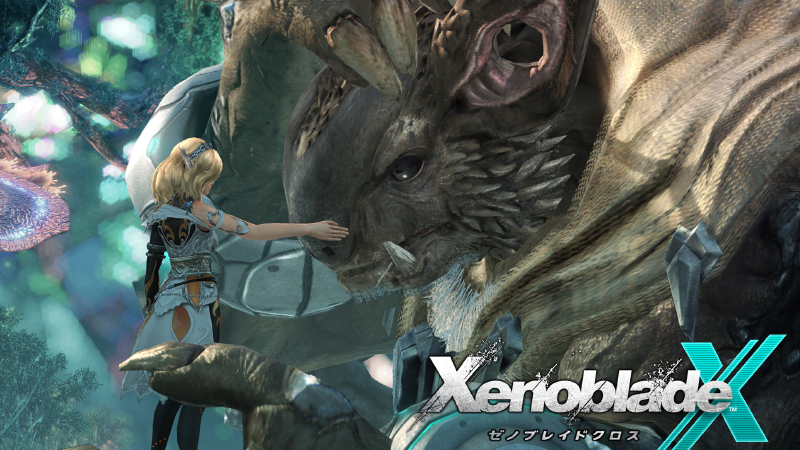 Every year, Nintendo would cover more and more of X, which came to be known as Xenoblade Chronicles X. New details were revealed each year at Nintendo’s live E3 events- this wasn’t a direct sequel to Xenoblade Chronicles, you play as your own character, Earth had been destroyed in a fight between two other alien races… and the only ship that escaped had to land on a foreign planet by the name of Rago- er, Mira after they ran out of supplies. There’s even a track from the Xenoblade Chronicles X soundtrack that sounds almost exactly like a melody from a Phantasy Star Online track within its first minute. This game is everything a lot of people wanted Phantasy Star Universe to be. A seamless world to explore, the returning story of people struggling to establish themselves on a new planet, massive vehicles in the form of Skells, and things I didn’t even know I wanted such as probes you can strategically chain for resources on the planet’s surface. It also takes great aspects of Xenoblade Chronicles such as the Collectopedia that make perfect sense in the context of Mira being a whole new world and new native plants and creatures needing to be researched. Divisions also exist, some specialize in taking out Indigens(aggressive native Mira lifeforms), some are skilled at placing probes and exploring, and some collect samples and other things for those in New LA to aid in research. There’s also the separate classes you can choose from and have loads of references and skills from Xenoblade Chronicles. There's online elements for people to engage in. ALSO- Photon Sabers. It’s natural that any PSO fan would feel the magnetic pull of Xenoblade Chronicles X. So I guess that’s why I’m so hyped for Xenoblade Chronicles X. I’ve only been waiting 11 years. And that day has finally come!